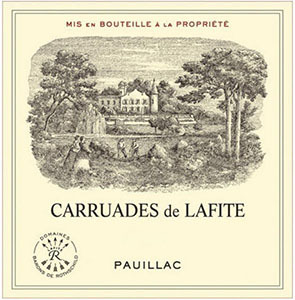 The Carruades de Lafite has a deep garnet/purple hue. It is more approachable than the Grand Vin, with scents of blackberry, tar, graphite and a touch of ink. The palate has quite stemmy and foursquare, not a complex Carruades and I feel just a little short on the finish. I much prefer the Duhart this year. Tasted November 2011. A blend of 50.6% Cabernet Sauvignon, 42.4% Merlot, 2.2% Petit Verdot and 5% Cabernet Franc, the Carruades has a refined, very well delineated bouquet of blackberry, a touch of plum, Mirabelle, cedar and smoke. The palate is medium-bodied, fine tannins, smooth and sensuous, not a powerful Carruades, more approachable than previous vintages, the tannins a little softer and smoother. Good length. Very fine…but it does not exceed expectations. Tasted March 2010. Currants and blackberries on the nose. Spicy and intense undertones. Full body, with juicy fruit and a soft, very silky texture and a long, long finish. Polished and very pretty. Best Carraudes ever. Try in 2018. Sweet berry and currant on the nose, with hints of cedar and sandalwood. Full-bodied, with wonderful milk chocolate and berry character. Long and supersilky. Love the balance to this. Slightly green tea aromas and flavors at the finish hold me back a little. 55% of the crop. 51% Cabernet Sauvignon, 42% Merlot, 2% Petit Verdot, 5% Cabernet Franc. Very deep crimson with a slightly pale rim. And lots of blue in it - a bit of press wine? Sumptuous nose already. Lightly inky start but then luscious texture and so round and polished. Great freshness and enormous polish, Doesn't taste as though there was lots of press wine in here. Great round stuff. Just a little kick at the end and a very slight hole towards the very end of the palate - otherwise fabissimo. But quite early maturing? Date tasted 1st April 2010. Drink 2015-2025. The nose is very perfumed, the fruit sweet. Ripe flavours flesh out the mid palate, the lushness is though well balanced by some bilberry, freshness that lifts and lengthens the flavours. It has lots of charm, rich yet elegant. Drink 2020-2040. Dense red, fine fragrant red/black fruits, firm and elegant structure, restrained, almost serious wine that promises a good future. Drink 2015-22.